Mediastinoscopy – investigation of the mediastinum with disposed therein lymph nodes of the trachea, bronchi and lungs, as well as other anatomical structures are widely used in clinical practice. During this procedure the attending physician has the opportunity not only to examine itself the mediastinum, but also to do a biopsy, i.e. to take a small piece of the lymph node for further morphological studies. This allows us to deliver the most accurate diagnosis and confirm the estimated disease. Mediastinoscopy should always performed by an experienced technician, having passed additional training. Diseases of the mediastinum is very difficult to detect with conventional techniques (CT, MRI, Usii etc.). That should include preparing the patient? Conducting this invasive method of examination, as a mediastinoscopy, which requires proper preparation of the patient. The most important stage – clinical examination of the person and letting the General analysis of blood and urine tests to detect diseases of the internal organs of acute and chronic in nature. In addition, it is desirable to conduct research of blood coagulation to prevent bleeding during the procedure. It is important to collect information on allergic diseases, reactions to medications and previously conducted operations on the chest cavity. For 8-10 hours before the test is not recommended for you to eat, and 2 hours and water. Such measures are necessary to prevent reflux of stomach contents into the lungs with the development of aspiration pneumonia. Compliance with the rules of preparation for the examination to minimize the risk of complications both during diagnosis and after it. In connection with necessity of application of General anesthesia, the anesthesiologist shall undertake the preparation and premedication of the person with use of selected medications. READ MRI of the brain: is it harmful how often can you do? The appropriate method of anesthesia is General anesthesia, allowing the doctor to safely carry out the examination, and have a high level of patient safety. Man was placed on the operating table with her head thrown back. 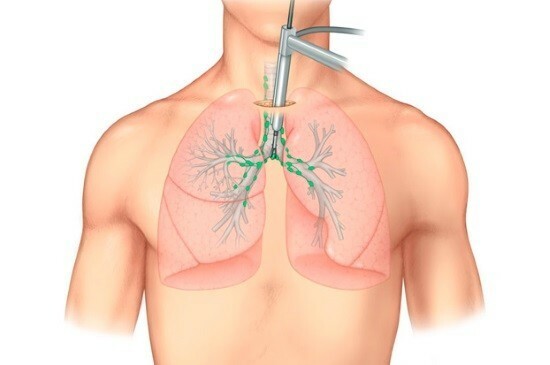 A necessary condition of the mediastinoscopy is an artificial lung ventilation. Then using a small incision in the upper part of the thorax into the mediastinum impose a special endoscope equipped with a video system. The doctor carefully evaluates the condition of the lymph nodes and other anatomical structures, and conducts a biopsy if necessary. After the procedure is finished, the endoscope is removed and the wound is sutured with stitches. The average duration is 40-60 minutes depending on its purpose. Within days after the examination, the person has to be in a medical facility under constant medical supervision. This helps to prevent the development of early complications and speed up rehabilitation. Allergic reaction to used drugs in the form of urticaria, angioedema or anaphylactic shock. Bleeding from the vessels of the subcutaneous tissue in the place of the implementation of the access to the mediastinum. Damage to the lymphatic or blood vessels of the mediastinum or other anatomical structures. Purulent inflammation of the surgical wound. A full examination of the patient and the collection allergological anamnesis can prevent the development of complications in most cases. With the development of complications should immediately begin treatment to stop the progression. An important advantage of the procedure is of high importance in the diagnosis of diseases of the mediastinum, in particular, lymph nodes. Disease such localization is very difficult to identify and to clarify their nature, so the possibility of a biopsy with morphological study allows us to put an accurate diagnosis in most cases. This method takes little time and is not associated with a high risk of complications, allowing the patient quickly returns to normal. The invasiveness of the study the need for General anesthesia, serious flaws in the procedure, therefore its use is possible only under specified indications and contraindications. Mediastinoscopy is a highly informative method of examination of lymph nodes of the trachea, bronchi and lungs, enabling to perform a biopsy. It helps to make an accurate diagnosis and prescribe the most appropriate treatment, ensuring the recovery of the sick person.